Krishnakumar Kunnath (popularly known as KK, K.K. 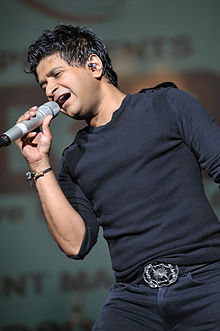 or Kay Kay) (born 23 August 1968) is an Indian singer. He is a prominent singer in Hindi, Tamil, Telugu, Kannada, Malayalam, Marathi, Bengali and Gujarati languages films. KK is noted for his clear and soothing voice; broad vocal range and noteplay. He is considered as one of the most versatile singers of India. KK married his childhood sweetheart Jyothy in 1991. His son Nakul Krishna Kunnath sang a song "Masti" from his latest album Humsafar with him. KK also has a daughter named Tamara Kunnath who, according to KK, loves playing piano. KK says that his family is his source of energy. KK has been greatly influenced by the singer Kishore Kumar and music director R. D. Burman. Michael Jackson, Billy Joel, Bryan Adams are also favourite international singers of KK. KK has said that it is not important for a singer's face to be prominently seen – saying he believes the important thing is that "a singer must be heard." KK has never undergone any formal training in music. After graduating from Kirori Mal College, Delhi University in commerce, KK had a brief stint of eight months as marketing executive in the hotel industry. After few years, in 1994, he moved to Mumbai. In 1994, he gave his demo tape to Louis Banks, Ranjit Barot and Lesle Lewis to get a break in the music arena. He was called by UTV and he sang a jingle for Santogen Suiting ad. In a span of four years, he has sung more than 3,500 jingles in 11 Indian languages. He got the first break in Mumbai from UTV to sing jingles. He considers Lesle Lewis as his mentor for giving him his first jingle to sing in Mumbai. KK was introduced as a playback singer with A. R. Rahman's hit song "Kalluri Saaley" and "Hello Dr." from Kadir's Kadhal Desam and then "Strawberry Kannae" from AVM Productions's musical film Minsara Kanavu (1997). Pritam Chakraborty is also a fan of him. He got his Bollywood break "Tadap Tadap" from Hum Dil De Chuke Sanam (1999). However, prior to this song he had sung a small portion of the song "Chhod Aaye Hum" from Gulzar's Maachis. Till now, KK has sung more than 500 songs in Hindi and more than 200 songs in Telugu, Bengali, Tamil, Kannada and Malayalam languages. He has worked with almost every music director of Hindi film industry active from 1999. He has lent his voice to the biggest hit song of the year 2014 "Tune Maari Entriyaan" among several others in Gunday. KK's new song from the movie Bajrangi Bhaijaan called "Tu Jo Mila" has become popular, many times remained No.1 on iTunes. Guinness World Record holder Kumar Sanu who reigned as the top playback singer during the 1990s, has mentioned in several interviews that from the new generation of singers he admires KK. Popular singer Arijit Singh said he has been inspired by KK in singing, and is a big fan of KK. Another popular Bollywood singer, Ankit Tiwari also said he has been greatly influenced by KK and he takes KK as his idol and inspiration. On 22 January 2008, KK released his second album Humsafar after a gap of eight years. The songs "Aasman Ke", "Dekho Na", "Yeh Kahan Mil Gaye Hum" and "Rain Bhai Kaari (Maajhi)" are famous songs from this album. Besides, KK had also sung an English Rock Ballad "Cineraria". The title track, "Humsafar" is a mix of English and Hindi lyrics. The album Humsafar has 10 songs, out of which eight have been composed by KK. The other two songs were taken from his previous album Pal. KK has also sung many television serial songs like Just Mohabbat, Shaka Laka Boom Boom, Kuch Jhuki Si Palkein, Hip Hip Hurray, kavyanjali, Just Dance . He has also sung the theme song for Star Parivaar Awards 2010 with Shreya Ghoshal. KK appeared on television too. He was invited as jury member for a talent hunt show Fame Gurukul. KK also has sung a song named "Tanha Chala" for the Pakistani TV show The Ghost which was aired on Hum TV in 2008. The song was composed by Farrukh Abid and Shoiab Farrukh, and Momina Duraid penned the lyrics. KK participated in the latest musical venture of MTV India Coke Studio. There he sang one qawwali "Chadta Suraj" along with Sabri Brothers and a recomposed version of his exquisite track "Tu Aashiqui Hai" from movie Jhankaar Beats. He also came in 'Surili Baat' in Aaj Tak Chanel. He has also performed in Sony Mix TV Show and MTV Unplugged Season 3, aired on MTV 11 January 2014. KK was in Dubai for his concert 'Salaam Dubai 2014' in April. He also did concerts in Goa, Dubai & Chennai, and Hong kong. On 29 August 2015, KK appeared in the television singing reality show Indian Idol Junior Season 2 to cheer up the emerging singers of India where he performed "Khuda Jaane", "Mera Pehla Pehla Pyaar", "Make Some Noise For The Desi Boyz", "Ajab Si", "Sach Kehraha Hai Deewana" and many more songs with the junior idols and "Tu Aashiqui Hai" with Vishal Dadlani, "Aashaayen" with Salim Merchant and "Tadap Tadap" with Sonakshi Sinha. After 10 years, He appeared in a singing reality show as a judge and guest jury member. On 13 September 2015, KK came in "Baaton Baaton Mein" on Sony Mix. In 2013, KK sang for an international album, Rise Up – Colors of Peace, which consists of songs written by Turkish poet Fetullah Gulen and sung by artists from 12 countries. KK recorded a song named "Rose of My Heart" for the album. In 2010, the Indi Band "Bandish" produced their second self-titled album. The album has a high energy track in the album Tere Bin – a rock ballad sung by KK. His debut album Pal was released in April 1999. His performance on the album received a Star Screen Award from Screen India for Best Male Singer. His second album, Humsafar, was released nine years later, in January 2008. It belongs to the pop-rock genre and has a total of 10 songs. Humsafar has two songs that are repeated from his earlier album Pal – "Din Ho Ya Raat" and "Mehki Hawa". The video for a romantic song on the album, "Aasman Ke", features the singer and south Indian model Suhasi Goradia Dhami. "Humsafar", the title track, has an interplay of English and Hindi lyrics and is about one's conscience and how it is a constant companion in the journey of life. One of the songs, "Yeh Kahan Mil Gaye Hum", was penned seven years before the release. "Dekho Na", a rock number, was written six years prior. The remaining six songs were developed in the last two years before the release. Other songs in the album include "Rain Bhai Kaari (Maajhi)", a mix of Bengali Baul with rock with a tinge of S D Burman, and "Cineraria", a fun-filled English ballad. KK himself wrote the lyrics of "Cineraria" and the English part of "Humsafar", the title track, while the remaining tracks were written by others. ^ "The right note". The Hindu. 9 December 2006. Retrieved 2 October 2017. ^ "Best KK songs-Top 10". Retrieved 3 April 2017. ^ "Music runs in the family". BombayTimes. Retrieved 13 November 2017. ^ Lasrado, Richie (25 November 2006). "A Kandid Konversation with KK". Daijiworld.com. ^ R, Balaji (6 June 2005). "The KK factor". The Hindu. ^ a b "KK sang 3,500 jingles before Bollywood break". Sify movies. 28 April 2009. ^ "KK". www.saavn.com. Retrieved 15 December 2017. ^ "KK Profile". In.com. Archived from the original on 11 May 2009. Retrieved 30 August 2009. ^ a b c "Sensational Singer KK to Perform Live in City on Nov 23". Daijiworld.com. 22 November 2006. ^ a b Vijayakar, Rajiv (18 February 2008). "High Pitch". Screen. ^ "KK Interview with Bollywood Hungama". Bollywood Hungama. 15 April 2015. Archived from the original on 19 April 2015. ^ a b "It takes three to tango". The Hindu. 13 March 2007. ^ D, Jhonny (4 July 2003). "On a high note". Screen India. ^ Preeti Verma Lal (10 March 2014). "Dreams in his eyes". Deccan Chronicle. Retrieved 4 February 2015. ^ "Star-studded music launches are back". Screen India. 5 February 2008. ^ "Composing music is an extension of my being:KK". Sify movies. 24 February 2008. ^ a b "8th Annual Star Screen Awards 1999". Screen India. Archived from the original on 24 June 2009. Retrieved 15 September 2011. ^ "K K : Awards & Nominations". Bollywood Hungama. Archived from the original on 21 November 2008. Retrieved 30 August 2009. Wikimedia Commons has media related to Krishnakumar Kunnath.